Bretagne, a 15-year-old golden retriever that lives with her owner Denise Corliss in Cypress, Texas, is believed to be the last surviving search dog that assisted at the World Trade Center on September 11, 2001. 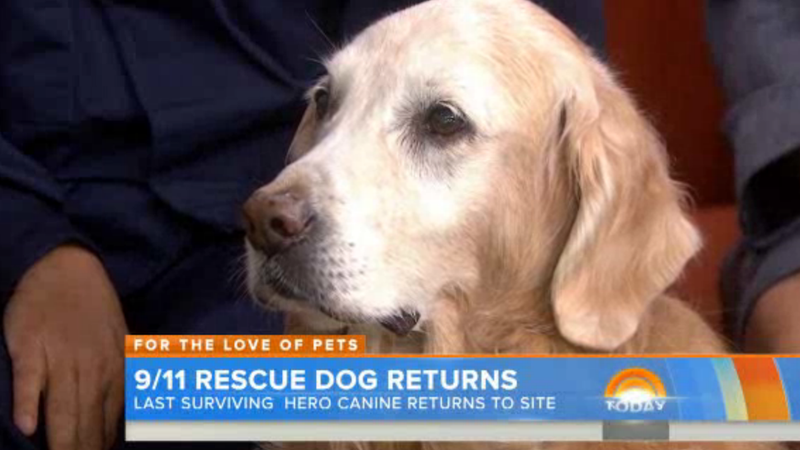 Today, she's back in New York and a nominee for the American Humane Association's Hero Dog Awards. Cue tears. To mark the 13th anniversary of the World Trade Center attacks, Corliss and Bretange were interviewed this morning on The Today Show. What [Corliss and Bretagne] never could have anticipated was the site of their first deployment: The twisted pile of steel beams, concrete and ash where the World Trade Center once stood. It was a harrowing assignment for the most seasoned rescue workers, and it could be a frustrating one for search dogs because there were no human survivors to be found — only human remains. Bretagne persevered through nearly two weeks of 12-hour shifts at Ground Zero. On her very first search, she had to balance precariously on a wet metal beam — and she slipped. But she recovered quickly, pulling herself back up onto the beam with her front paws and continuing to sniff intently as if nothing had happened. Bretagne's true act of heroism took shape in a way that initially surprised her owner. "When we were staged adjacent to the pile waiting, searchers and rescuers would come by to pet her, to thank her and to tell us their stories — why they were here," Corliss tells Tom Brokaw. "And so [she took on] the unexpected role of a therapy dog." Corliss reports that these days, Bretange is happy and healthy. What a brave sweetheart.